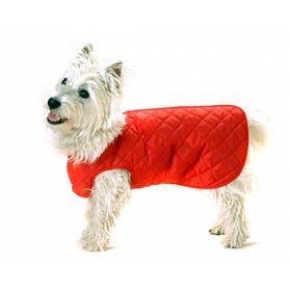 A Red quilted showerproof dog coat made in the UK by Cosipet. The style is a step in design giving protection to the underneath of the dog and fastening with a zip along the back. This coat is warm and washable and fitting measurements are taken from the neck to the base of the tail. Suitable for Golden Retriever and Dalmation size dogs.